Diatomaceous earth is a gentle abrasive that is also highly absorbent, and it's almost entirely made of silica - an important component of human ligaments, cartilage, and musculature. Diatomaceous earth is one of the cheapest and most versatile health products on the market. Diatomaceous earth offers an alternative method for detoxing your body, It doesn't require any fasting and it is cheap, simple and effective. Because of it's absorbent and abrasive nature, it makes an ideal internal cleaner. As it passes through your system, it absorbs toxins, and it doesn't require any change in your lifestyle or diet. We are all exposed to harmful toxins every day like food additives, cleaning supplies, car exhaust and heavy metals. Our bodies are pretty good at cleaning out a lot of these things on its own, but sometimes they need a little extra help, and that is where detoxing with diatomaceous earth comes in. If you suffer from any of the symptoms on the following list, it may be time for you to consider detoxing. Detoxing with diatomaceous earth is really quite easy. Take about one teaspoon of food grade diatomaceous earth with water once a day. Take it on an empty stomach or at least one hour before eating or two hours after eating. It isn't offensive tasting and has a gritty nature. Some people like to put it in their smoothies, juice or yogurt for this reason. Over the next few weeks, slowly raise your dosage from one teaspoon to two teaspoons, taking one in the morning and one at night. Gradually work up to a tablespoon a day. Drink a lot of water because the diatomaceous earth is very absorbent, so it's important to stay well hydrated. Depending on the type of cleansing you need you will have to determine the length of time. If you have an issue such as diarrhea or suspect a parasite it is recommended you continue with the daily process for 30-90 days. It is not uncommon to feel some side effects, such as headaches and flu-like symptoms. These are caused by toxins dying off and leaving your body and is not a cause for concern. If the symptoms become too bothersome reduce the amount of diatomaceous earth and your symptoms will ease off. As you continue on with your detox over the passing weeks whatever symptoms you have - that encouraged you to do the detox in the first place - should start to decrease and go away altogether. Many people feel as though they have a new lease on life and feel more energetic and better than ever. Are There any Side Effects From Taking Diamotaceous Earth? There are really not any known side effects that come from eating food grade diatomaceous earth. The FDA re3cognizes that diatomaceous earth is used as a filter aid in other products, and this poses no problem to users of those products. As with anything don't assume more is better, follow the dosing suggested and always be sure you are buying food grade. If pregnant or nursing consult with your doctor before ingesting this supplement. Diatomaceous earth is an amazing dietary supplement because it helps to move things out of your intestines and helps promote healthier hair, skin, bones, and joints. Upping your water intake will help with any unpleasant flu-like symptoms that may occur during the die-off period. The more water you drink the quicker you can flush these toxins out of your system. The flu-like symptoms are not caused by the diatomaceous earth but rather the toxins from parasites that are dying off in your system. Silica in diatomaceous earth is actually a primary ingredient in many over-priced hair supplements at your local pharmacy. If you have thinning hair, you can begin to see new hair growth after just a few weeks of taking DE, giving your hair a fuller, healthier look. Collagen, another building block of healthy skin production, is enhanced by silica from diatomaceous earth. Silica will make your skin smoother and healthier looking. Silica is not only healthy for hair but also for your nails. If you have a history of dry brittle nails taking DE will make them stronger in just a few weeks. Silica plays an important role in the health of skin, hair, and nails. This basic mineral serves as a building block for healthy bones, teeth, skin, and tendons. If you have a deficiency of silica in your body your skin will slacken, nails weaken, and hair become dry and brittle. Your hair will show the first signs of low silica intake. Some people who are experiencing hair loss need to simply increase silica intake to see hair growth rebound. Within weeks of increasing, silica intake hair growth will be notable. 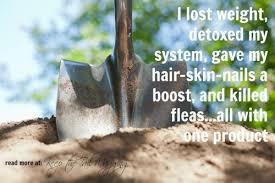 If you want beautiful healthy hair without the expense of monthly supplements than diatomaceous earth is for you. Add diatomaceous earth to a container of toothpaste to whiten your teeth. Use 9 parts toothpaste to 1 part diatomaceous earth. Remember you must always be very careful not to inhale the powder as it is damaging to your lungs. Always wear a mask when mixing your diatomaceous earth. Mix DE with water roughly 1 part DE to 3 parts water in a bowl. After making this paste-like formula you can use it as a scrub which you then leave on as a mask until it dries out and gently remove with water. This will help to promote healthy skin as an exfoliator and is able to remove deposits of dirt, oils, and dead skin cells. Here is a great recipe for a deodorant that won't irritate your skin. Because of the absorbent nature of DE, it makes a perfect deodorant. Choose an essential oil that you like the smell of to use with DE to make your deodorant. Recipe: 3/4 cup cornstarch, 1/4 cup food grade diatomaceous earth, 1/2 cup melted coconut oil, 1/2 teaspoon essential oil. Place all dry ingredients together in a mixing bowl and combine evenly. Gradually add liquid to dry ingredients, stirring well until combined. Once the coconut oil reaches a consistency similar to peanut butter, transfer it to a container with a lid. Apply to armpits using two fingers. Diatomaceous earth is deadly for insects. It is a powerful weapon against insects such as bed bugs, ants, fleas, cockroaches, and many more. When bugs come into contact with DE, the abrasive nature of the product cuts holes in their exoskeleton and dehydrates them. Apply diatomaceous earth to areas where pests traffic the most. Use an old spice bottle to shake the DE to areas where pests are. Let the application sit for several weeks. DE will work quickly, killing most kinds of bugs a couple of hours within contact. Leaving it in place a couple of weeks will ensure that it is effective. DE will work for you if this process is followed. If you are using this in carpet it is best to have a plan before you apply it. Consider having a scheduled time to rent a carpet cleaning and use a vacuum, like a shop vac so you do not damage your traditional vacuum. If applied to hard floors or countertops you can sweep and mop it up. One of the most harmful outdoor pesticides is Roundup; it's loaded with harmful chemicals that are known to cause cancer. Combine the following ingredients in a container. Diatomaceous earth was used back in ancient cultures to keep their grains free from insects. This is still widely practiced today in agriculture for grains and animal feed. You can also use DE to help preserve food storage items such as grains, flour, legumes, rice, corn, and other dry foods. Not only does DE repel insets, it also absorbs any moisture, which helps keep stored food dry and mold-free. Using DE is completely natural and eliminates the need for artificial preservatives. It is recommended that you add 1 teaspoon of DE for every pound of food you are storing ( or 1 cup for every 50 lbs. of food, if you are storing larger quantities). Dust a thin layer of De over the bottom of your food storage container. Pour 3-4 inches of food into the container on top of the DE. Apply another layer of DE on top of the food. Continue layer 3-4 inches of dry food between layers of DE until your container is full. Cover the container and give it a good shaking. Open the container and put one final layer of DE onto the food and don't mix this layer in, just let it rest on top. Seal the container and place it in storage. When you are ready to use the food you have stored, you can place it in a strainer and rinse it off. This isn't mandatory and the DE won't change the way your food tastes. Obviously, you can't rinse the DE out of flour and it will contain trace minerals which is fine. Number one safety precaution is you must buy food grade diatomaceous earth. The non-food grade is dangerous for you, your family, and your pets. It is imperative that you know the type of DE you are purchasing. Read the labels or ask the supplier and know if you are getting the right product. Use the following precautions when using DE. 1. Use a breathing mask or another type of covering for your nose and mouth. 2. Apply DE in an area that is ventilated to prevent airborne build up. There are many people who report weight loss while using diatomaceous earth. While there is no supported claim it is recognized that widespread testimonials of people who have lost weight while using diatomaceous earth. It is possible that overall digestive health cleaning could help to speed up a body that was laden with toxins weighing them down. Getting rid of toxins improves your body's ability to function, which may, in turn, cause you to exercise more, eat better, and lose weight. Some people have stated that taking diatomaceous earth first thing in the morning curbs the appetite throughout the day and lower their sugar cravings. Drinking more water may also contribute to weight loss as it flushes our system. People who drink a lot of water tend to drink less soft drinks or other high-calorie beverages. So can DE really cause you to lose weight? It very well may indirectly by cleaning the junk out of your body and increasing your energy to allow for more exercising and a more health-conscious lifestyle. Pets Can Use Diatomaceous Earth too! Diatomaceous earth is used readily to rid pets of various types of worms and parasites. Sprinkle it onto their food regularly to keep them free from hosts. It also works on fleas too. When you choose to use diatomaceous earth to protect your home from pests and weeds it also protects the earth. There are millions of pounds of pesticides dumping into the United States each year, No one really knows how much damage is being done that we don't see. Pesticides are seeping into our water sources and contaminating, birds, fish, animals, and insects. These pesticides are contaminating us and exposing us to all kinds of different health risks. So much time and money have gone into producing these harmful products that are poisoning us and our environment. With over a $1.3 billion dollar a year profit it's not surprising these manufacturers are thriving. We can all help to reverse the production of these chemicals by stopping using them. 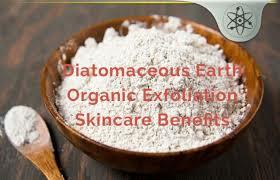 Diatomaceous earth gives us an alternative solution.